Read the the post introducing the new theme + watch the video. Learn how to submit your work. Keep reading for prompts/activities to inspire your creativity. Quite simply, the next issue’s theme asks the artist to reflect on 2014. Consider your year, its triumphs and failures and show us. Photograph, film, paint, draw, and write. 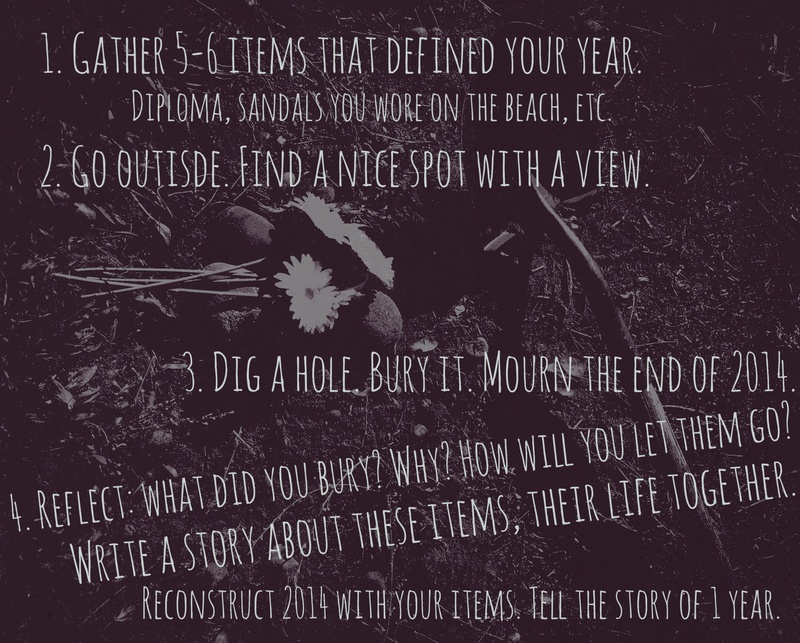 Write about the process of gathering these items, digging the hole, and letting them go. Write about the items separately and together; let them tell unique stories about one character/person’s life over the course of 365 days. Imagine yourself stumbling across a grave marked “2014”. What do you discover? Tell us about the the world of “2014” and his/her existence. _____________________. Create unprompted. Run free. It can be about you or someone else. Someone real or imaginary. Reconsider these prompts in different artistic mediums: dance, sing, or submit a video. Photograph and paint. Paint a photograph. Run free. GirlSense & NonSense Magazine publishes honest, provoking art. It need not respond to a prompt mentioned above. It simply needs to reflect on the issue’s current theme. So let go and run free. How to submit for the March Issue>Click here.